Zak Thorpe a young story artist in training who found our site of great help in his own film making journey has shared a great resource for kid's making films. Hopefully some other kid's will find the following link useful. 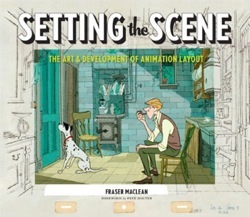 Just received my copy of Fraser Maclean's Setting the Scene: The Art & Evolution of Animation. If you are in animation or looking to enter the world of animation - this book is a must. Layout is an integral and extremely important part of the animation process. The better a scene or sequence is planned out in layout, the better prepared it will be for animation, background painting and eventually final camera - or what would now be compositing. I have only just started to peruse the book, but I can already tell Fraser has done his homework. It's an awesome resource to have and will benefit anyone not matter what your job is in animation. "Setting the Scene: The Art & Evolution of Animation Layout"